I recently have been reading John Sloan’s, The Gist of Art (presently re-titled, Sloan on Drawing and Painting, Dover). Both Henri and Sloan participated early on (1909) in color sessions presented by H.G. Maratta explaining his color theory. 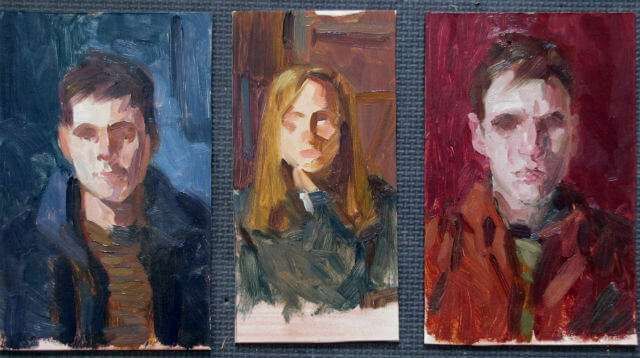 These were held in the studio of Charles Winter. These sessions basically changed the artistic direction of all of the participants, especially Robert Henri. I have spent the past 15 or so years experimenting with H.G. Maratta’s color theory as interpreted by Henri in his notebooks and letters as well as through his paintings. Now, I have been able to examine the same theories through the eyes of John Sloan (in The Gist of Art). And I have discovered some interesting concepts in regard to Hue that I have overlooked. The interesting thing about Maratta’s theory is that the “concept” is set, but the color and one’s intuitive sensitivity to color is uniquely the artists’. What I need for my own particular image or painting, no matter what it is, is possible within the confines of Maratta’s theories. In fact, one of the most amazing things is that one’s palette and one’s understanding of color in all its subtlties becomes highly refined, allowing one to achieve a greater variety within a smaller range of color. Instead of one constantly re-using the same combination of colors to achieve an effect, one quickly discovers there are other ways to achieve a similar passage of color. One great example that I use often: to achieve a lower intensity of a yellow, instead of using the complement (Purple) to lower the intensity, one could mix a yellow of less intensity (hue) by combining O + G. So the same color can be achieved by using 2 secondaries. Another example: to mix a blue (hue) of lower intensity, one can mix P + G. Again using secondaries instead of subduing a primary with the complement. What one gets is a similar color but a much more interesting one. In fact it has more life and force than a combination of complements. One also learns to take advantage of “near” complements verses direct complements. One gets a hue, but it is a hue that has a far greater range of subtlety. I am writing this because I discovered another aspect to this theory in The Gist of Art– It is the process whereby one adds emphasis to the main chord by expanding the range of hues within the composition. These hues act as a nuetral foil, within an image, upon which the main colors of the chord are seen.They in fact bring out the true color of the chord in a harmoniuos way. These hues interface with the main chord and allow the viewer to feel that a specific color in the chord resides throughout the composition. One color in the main chord appears in several intensities. Henri refered to this aspect as “Radiating Intensities“. Let’s say my chord (color placed at specific intervals along the color spectrum) is RO-YG-B. I can take the Blue of the chord and carry it throughout the painting in several intensities so that the blue seems to radiate throughout the image. So the B can appear at its full intensity in a very small area and then appear as a B- Bi color of moderate intensity in a slightly larger area and then appear as a B–Hue in an even larger area. When one looks at the image, one has the feeling, in a very subtle way, of blueness. This method also conveys a feeling of color recession. The color Blue can reside in the foreground in full intensity, and as that color recedes, its intensity is diminished. One experiences the power of the light on the blue and as the light is diminished moving toward the background, the intensity of the blue is diminished. It can also be effective to turn a form (modeling a form from light to shadow). As an object faces the light, the color can be more intense and as the object turns away from the light source and moves into shadow, the color intensity can diminish. One could move from the most intense Blue to a transition of a Blue Bi color to a Blue Hue, having the lowest intensity occupying the general tone of the shadow. The idea of the Hue backing up the power of the chord as well as assisting in the modeling of a form is something that I intuitively have done on and off in my work. What is exceptional about Maratta’s ideas, and this one in particular, is that now it is no longer just intuition guiding me. Now that it has become conscious, I can experiment and study this idea and take full advantage of its promises, bringing a greater feeling of harmony and dynamism to my work.